There was a time when you'd be branded a fool for ever thinking that Nintendo and Sega would team up to release content on the same system, but these days you can find Sonic splattered all over the Switch's eShop almost as much as Mario himself. Taking this newfound partnership further - and beyond the realms of reality - this custom paint job fuses the two companies together in hardware form. And we really, really like it. 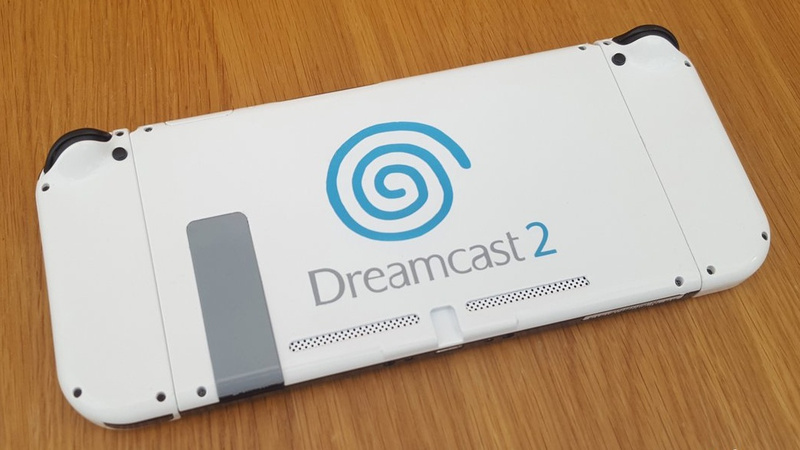 Customised by the folks over at Extreme Consoles - a UK-based company which specialises in airbrushing and hand-painted designs for controllers and consoles - this design is inspired by the idea of a Dreamcast 2. While Sega's Dreamcast has never seen a successor - and likely never will - this will no doubt have fans of the company screaming for a new system once again. Would you like a Switch like this? Would you make it look like a different console, perhaps? Tell us below with a comment. Does this mean Chu Chu Rocket will come to Switch? Anybody else love the look of a white Switch? Shouldn't this have been a WiiU skin? This looks awesome, Nintendo should really make A white switch. Does it sound like an angry printer when it's loading games? Do the controllers beep loudly when they're low on battery? I like as long as the left joycon can charge like the original and rumble. I prefer my black Switch over a white Switch but this is still well done! On a side note, I can't believe the VMU never really caught on. I understand that now memory cards are not really needed but I'm surprised something like this wasn't used up until hard drives we're used in consoles. I remember using the screen to pick plays in NFL 2K so that the other player couldn't see. Successor. A predecessor would be Sega Saturn. And it looks pretty nice. That is very cool looking. I like what they did with the joycon joystick attachrment, really loooks like a Dreamcast joystick. Wii U skin would be more appropriate. I think that the original Switch dock is the ugliest thing ever but the original Switch itself is not bad. The white colour is very nice on the Switch though. @AgEnt721 It looks good, better than any special edition Nintendo could have made. Thought the same. Sometimes the author should read what he/she wrote before posting. And yes, a white switch would be so nice. @NEStalgia Dreamcast is a more rare system, thus making it more valuable, thus increasing the value of Switch because of the harder to find Dreamcasts! Just remember there are 50% MORE Wii U's sold than Dreamcasts, not to mention roughly 300% more Wii U games sold than Dreamcast games (approximately 33 million Dreamcast games were sold total compared to nearly 102 million Wii U games). So, by using a Dreamcast, they're upping the collectible value, because the more rare item is higher priced due to the rareness! @NEStalgia Nah, the OG Xbox is the Dreamcast 2. All the ports for Dreamcast now. Someone needs to make a Dreamcast 2 Steam Machine (a Steamcast?). With the way Sega are releasing most of their games on PC these days, it would make sense. This is amazing and I'll take 15, please. Fitting considering that we're probably going to get the Dreamcast Sonic games before 3&K on the Switch. That is so freaking awesome. Dreamcast deserved a better end than what it got. Big time. If we get a Dreamcast Collection, they should reproduce this as a limited run with Dreamcast packaging for the cartridge packaging. Absolutely gorgeous... and much like the Dreamcast, the Switch's internet was late & a bit of a mess. I love both though! Phantasy Star Online port NOW!!!! The back is fine, even though Dreamcast 2 makes no sense. Front is fine except for the bizarre and off-putting circular lines cutting through the Joy-Cons. I get what they were going for but it aesthetically, it doesn't work. The grip is pretty shoddy, esp. considering the faux-VMU design isn't even centered properly. In that alternate timeline where Nintendo went under and Mario joined Sonic games instead. This makes me want a white Switch. @Folkloner I think that Dreamcast 2 does not make any sense either because Switch is a console which game library is based on Wii U, indie and multiplatform ports. Wii U was more "similar" to Dreamcast.